10,000,000 people live in Sweden, 4000 of them have chips. That a Looong way from "almost extinct". QUOTE: That's how it starts. They'll be standing in line for one when thats the only way they can eat. The only chips I'll be taking are Doritos Nacho Cheese, please. Sweden is rapidly turning into a cashless society, which seems like the utopian dream of many a government figure. What could possibly go wrong from the government’s point of view? Isn’t it ideal that they could soon digitally control every single person in the country? Actually, quite a few things are going wrong. So much so that even members of the government are expressing concern. The change is happening fast in the European country. Cash is used so infrequently that the government of the country has demonstrated concern. And this isn’t just in the big cities. A source in rural Sweden tells me that even in his remote area, the push to go cashless is omnipresent. The folks of Sweden have so little use for cash that it’s predicted many stores will no longer even accept it by 2025. And according to an article in the Financial Post, the government is beginning to have second thoughts. And the potential of a down-grid situation isn’t the only problem. Older Swedes and immigrants who aren’t really involved in the digital society could have great difficulty making transactions. We all know some folks who eschew online banking and never use a debit card. Many of these people are senior citizens who aren’t ready to learn a new technology. As well, there’s a cost involved in taking part in a technological economy: smartphones, internet service, and computers are simply not a part of the lifestyle of many folks. One group, the Swedish National Pensioners Organization, is attacking this issue by teaching classes to get them more comfortable with digital transactions. Just to emphasize…”the banks refuse to take cash.” THE BANKS. The reason given for the refusal to accept cash is that they wish to prevent recurrences of the violent robberies that took place in the early 2000s. And of course, there’s concern of government control. It seems rather ironic that it’s the government pointing out the possibility of trouble with government control in a cashless society, especially since they’re considering rolling out a new digital currency called the e-krona. If the government were in charge of the digital currency, the amount of control they’d have would be breathtaking. Could they simply make your digital currency invalid if you owed taxes or were suspected of a crime? Could they wipe out everyone’s online accounts in the event of some kind of bank holiday or economic collapse? If the grid went down in a long-term way, all you’d saved would be lost forever. A short power outage would cripple communities. Every single purchase you make would leave a digital footprint, and huge amounts of personal data could be mined from it. And what about the possibility of online bank robberies carried out by hackers? The list of things that could go wrong is infinite. And of course, it all goes back to microchips. Out of all the nations in the Western world, it seems that Sweden is the most enthusiastic about the embedding of microchips into humans “for convenience” purposes. Recently, Adam Palmer wrote about how thousands of Swedes were voluntarily getting the chip for their own convenience. Well, thank goodness poor Ms. Varszegi’s horrible burden has been lightened. Many readers expressed dismay, shock, and revulsion at the very idea of having a chip implanted in their bodies, and I’m with you. But we’re witnessing something important here. We’re watching an alarming glimpse at the future. The endgame of complete control truly seems to be in sight as more and more Swedes go cashless. That is a shame the number is increasing and a signal that the noose is tightening on the Death of Freedom. Until the next recession when people learn that their money and privacy is safer with their wealth in their pockets and not a bunch of electronic digits in a bank. In a Q and A with New York City council member Richie J. Torres, Grub Street notes that in addition to New Jersey, politicians in some eastern cities – including New York City, Philadelphia, and Washington D.C.- are also mulling restrictions on cashless stores. Another recent Grub Street piece, More Restaurants and Cafés Refuse to Accept Cash — That’s Not a Good Thing “Just because you don’t have a piece of plastic, you can’t get a sandwich? ”, describes the cashless trend in more detail. 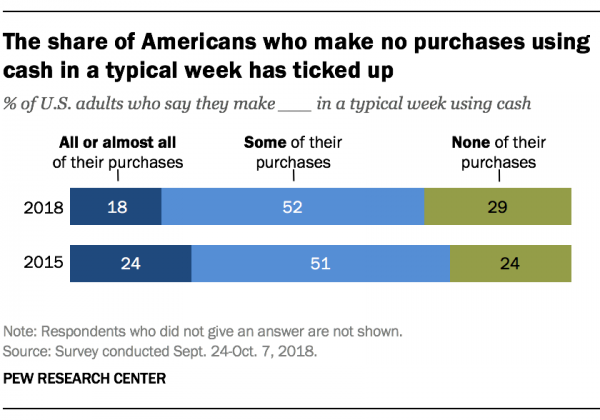 Despite these pushback measures, last week the Pew Research Center reported in More Americans are making no weekly purchases with cash that roughly 29% of US adults say they make no purchases using cash during a typical week – up from 25% in 2015. 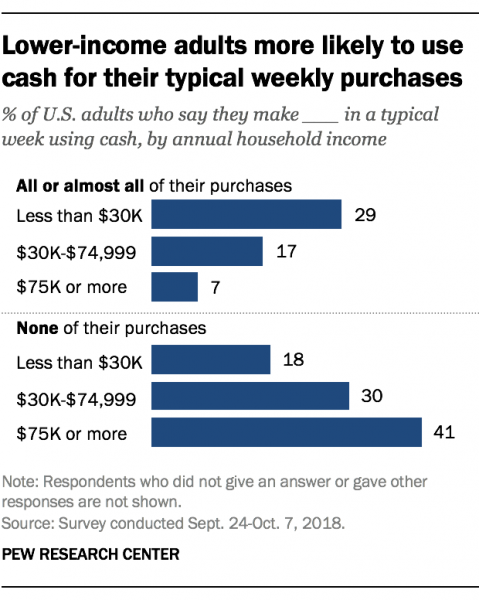 At the same time, the share of those who claim to make all or almost all of their weekly purchases with cash has dropped from 25% in 2015 to 18% today. As Figure 2 makes clear, declining use of cash correlates heavily with income. So, adults with an annual household income of $75,000 or more are more than twice as likely as those earning less than $30,000 a year to eschew cash purchases in a typical week (41% compared to 18%). Whereas more than four times as many lower-income Americans report they make all or almost all of their purchases using cash, compared to higher income Americans (29% vs. 7%). Pew reports that both race and cash use also correlate, with 34% of blacks using cash for all or almost all of their purchases, about twice that of the 15% of whites and 17% of Hispanics who rely on cash. Similarly, age is also important, with 34% of adults under the age of 50 making no cash purchases in a typical week, compared with 23% of those ages 50 or older. Some cities and states are actively pushing back against the trend toward cashless businesses. Pending or mulled measures that maintain a place for cash would ensure that public accommodations remain accessible to all – and not restricted only to those privileged to have access to a credit or debit card, or a mobile app. This entry was posted in Banking industry, Guest Post, Payment system, Politics, Regulations and regulators, Ridiculously obvious scams on December 16, 2018 by Jerri-Lynn Scofield. Yves here. I hope Clive and other non-US payment systems experts will pipe up, but banks in the US have hoist themselves on their own petard with respect to trying to get rid of cash. The article notes that these efforts are discriminatory, in that lower income people are often un or under-banked. But a second issue is that the US has old payment systems infrastructure because banks and other players chose to milk what they had, and they has resisted offering products to serve the unbanked at low cost. For example, in South Africa in 1997, employers would pay low-wage workers on a chip-based stored value card. It’s a disgrace that banks have yet to offer a non-gouging version of that sort of product for lower-income households here. Cash is cumbersome, dirty and increasingly too tangible for our digital desires. And while we’ve already given it up to a fair extent for the credit and debit card–it still means we have to wait in lines, and that’s so 1990s. In an effort to cut costs and avoid long lines in front of the cash register, a small-but-growing number of retailers have stopped accepting paper currency entirely. Over the past couple of years, some retail stores and restaurants in large cities have simply ceased cash operations. But the problem is that while it may be safer and more convenient to pay without cash, banning the use of cash could be discriminating against low-income individuals without credit or bank accounts because of the fees and minimum balance requirements. In fact, local and state governments are rather up in arms about the whole thing. Earlier this month, the Philadelphia City Council passed a bill making it the first major city to ban cashless payments. New Jersey. Now New York City, Washington, San Francisco and Chicago are now all weighing similar bills. “With a 26-percent poverty rate in Philadelphia, the mayor believes in equal opportunity for all,” city spokesman Mike Dunn said in an emailed statement to USA Today. “It is important to recognize the fact that not everyone has access to banks or lines of credit,” the New York Times cited State Senator Nellie Pou, one of the sponsors of the bill in New Jersey, as saying. Going cashless is inevitable, but much of the country isn’t ready for that just yet. This was mostly expressed in Philadelphia where more than one-quarter (some 400,000 people) live below the poverty line, according to a Pew Charitable Trusts report from last year. With $19,700 a year for an adult with two children at home these families lack access to credit cards. For New Yorkers who don’t want to wait in line anymore, it’s important to consider that despite some of our penchants for going fully digital, we are still largely a cash society. A Federal Deposit Insurance Corporation report from 2017 shows that 6.5 percent of the U.S. households were “unbanked”; in other words, households in which no individual has a checking or savings account. Another 18.7 percent of households were categorized as “underbanked”. And while those rates are declining all the time, they are still some large hurdles to a cashless society. It’s also worth noting that cash was the most frequently used payment instrument in 2017, accounting for 30 percent of all payments. Credit and debit cards were used in 48 percent of consumer transactions in 2017, of which 27 percent went to debit and 21 percent to credit card payments, according to the Federal Reserve report from the fall. Still, financial institutions are using every weapon in their arsenal to fight against cash because their customers are the ones who want to go cashless. Visa has been offering $10,000 each to as many as 50 restaurants and food vendors to pay for their technology and marketing costs in return for a pledge to go cashless. And e-commerce giant Amazon, for its part, came out in opposition to the New Jersey bill to ban cashless retail outlets. After all, it has five cashless and cashier-less pop-up stores and one bookstore there. Now it’s lobbying local governments who are considering their own ban on the Amazon automated stores. There are only a small number of Amazon Go stores in operation today, but the company was planning to open as many as 3,000 locations by 2021, according to Bloomberg. Now it might have jumped the gun as local and state governments worry about discrimination and poverty. This entry was posted in Banking industry, Guest Post, Payment system, Technology and innovation on April 5, 2019 by Yves Smith.